It’s a rainy somewhat miserable day today, which was the case yesterday too. I gotta admit though, I love the rain. It’s often the only “weather” we get where I live, so a couple of rainy days really don’t bother me. I find them the perfect time to take a hot bath, read a good book, and hop into some cozy yoga pants. Baths and books have been around forever, but what’s up with yoga pants? They can be seen all over and often on women who have never stepped foot in a yoga class. I personally love yoga but even I find it a bit baffling that fashion’s “athleisure” (i.e. : “athletic” meets “leisure”) trend has taken over closets everywhere and doesn’t seem to be going anywhere anytime soon. Basically this fashion craze consists of clothing traditionally reserved for gyms and yoga studios now being worn in workplaces, schools, and just about anywhere. Attention Kmart shoppers: gym clothes have left the gym. And maybe most importantly is that, yes, they can still be found in Kmart and other discount retailers, but also in department stores and luxury shops. Although originally designed as clothing meant to look athletic but with really no technical athletic function, athleisure soon became more than that and continues to be whatever it wants to be. “Sweats,” as the term used to be, were once reserved for gyms and homes. But, as much as you may have loved your draw-string, elastic-ankle sweatpants, you would never wear them out on a daily basis. But with a societal and generational increased interest in all things health and fitness came improved activewear fabrics and textiles, which made them not only more comfortable to wear out and about, but let’s be honest, they give the appearance that you are an “active” person whether you are or not. Add a plethora of styles and colors and you have yourself fashion. Previously though, you’d never go shopping in them much less to a restaurant or work. Times have changed though and we are officially a nation of yoga pants wearers. Just look around. You’ll see women everywhere wearing not only traditional yoga pants (usually slightly flared at the bottom with a wide waistband) but leggings, cropped leggings, and the stripes down the side track pants. Everywhere. And as if they were regular ole’ pants. In a time when “breaking barriers” is trending and buzzing, you could say activewear is leading the (run)way in that it’s truly breaking fashion barriers in offices and restaurants coast-to-coast. I love the style because you can dress it up or dress it down. Put on pair of sneakers and you have a casual but stylish look. Add some heels and a fashionable top or jacket and voila, girl’s night out here I come! So big is the athleisure market that U.S. imports of women’s elastic knit pants (yes, that’s really what they are ladies regardless of any logos or pricetags), surpassed those of jeans for the first time ever according to 2017 U.S. Census Bureau figures. It’s officially fashion’s “new casual” and today you can find more than 11,000 versions of activewear options that Americans spend nearly $50 billion on a year. The trend is not just reserved for pants and leggings though. Step into any athleisure store or department and you’ll find everything from athletic tops to sports bras. Shorts are also still in the mix and those “messy buns” you see women sporting? Yep, athleisurely hair. Blame it on improved fitness? Blame it on fashion laziness? 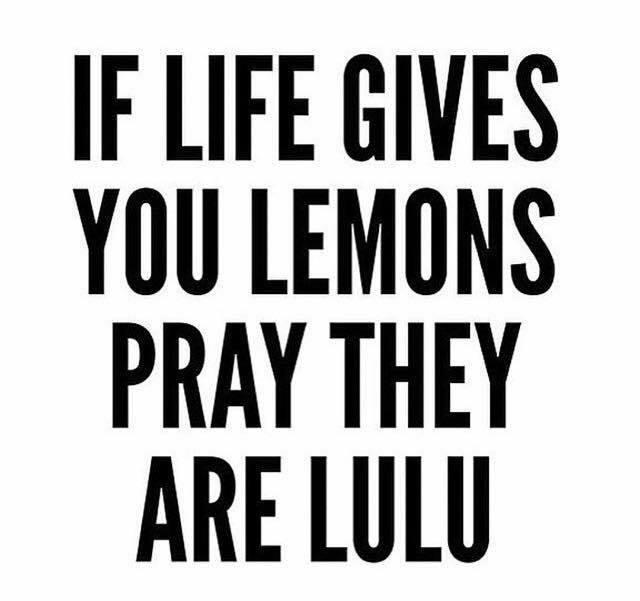 Some say blame it on Lulu. Lulu, as in retailer Lululemon, sold its first pair of yoga pants back in 1998 after Canadian Chip Wilson attended a yoga class for his aching back and not only loved the class, but the pants his yoga instructor was wearing. A lightbulb went off in the retail entrepreneur’s head and Lululemon was born. The pants that make your backside look good have never looked back. According to Bloomberg News, Wilson and Lulu’s initial leggings were meant for fitness studios and were a mix of nylon and Lycra. They were stretchy and soft and were just what many yogis were looking for. Lulu trademarked its original “Luon” fabric in 2005 and today boasts an R&D headquarters to explore things like “the science of feel” and to develop fabrics specific to particular activities. The brand had 2018 revenues of $3.2 billion and is unequivocally considered the coolest of the cool in the fitness apparel industry. Its famous “That Girl” logo, as I like to call it, is as coveted as any interlocking Gs or Cs. Personally I find the prices somewhat high and the stores a bit intimidating (I’m more a Target and Athleta girl) but Lulu lovers swear by the products and are considered one of fashion and retail’s most ardent representations of brand loyalty. Lulu lovers love their Lulu. The double Gs at Gucci have taken note. Business Insider recently reported that Gucci is suddenly hip and happening with millennials much in part to its embracing of what is also called “streetwear” so often spotted on the supermodels, reality stars, and singers millennials religiously follow and imitate fashion-wise. It seems this younger segment of the working and spending population is more concerned with uniqueness then luxury and their fashion dependence on athleisure has created a whole new fashion market. 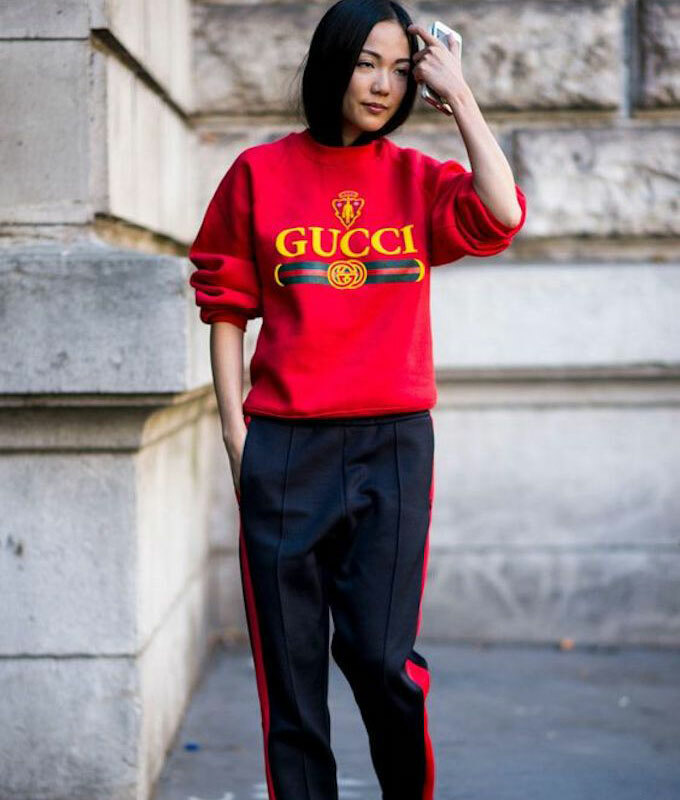 Alessandro Michele was brought on by Gucci as creative director and he quickly directed the creation of streetwear emblazoned with the company’s logo. It was a hit and competitors quickly followed suit. But let’s get this straight, yoga has been around for more than 2,500 years and spandex was on the scene long before Studio 54, so what gives? Why now stretchy fabric and why so much of you? UNLV Fashion Historian (now there’s a job I’d love to have) Deirdre Clemente told The Atlantic she thinks she has the answer and it’s threefold. First, synthetic fabrics are vastly improved; second, society is much more health and healthy appearance conscious; and third, there is a true relaxation of dress codes going on resulting in a decline of fashion formality. So you have versatile fabrics made into fashionable quality lifestyle apparel that make you look healthy. What’s not to love and makes perfect fashion sense, right? Yes and no. One must be careful and cautious about just what athleisure ware to wear. It should go without saying that if you’re a bit on the plus size, leggings may not be the most flattering choice. Opt instead for yoga-style or looser fitting pants and make sure those bums are covered up. Your fitness level should be considered too, as well as your age. You might be on the thinner side, but if you’re not toned maybe steer away from clothing that is extremely tight or sleeveless and keep in mind age matters. What a 23-year-old wears might not be age appropriate for a 53-year-old, regardless of size and shape. And call me old-fashioned, but I think sports bras should be worn solo only when truly working out…in a gym…and if you have the body for one. Okay and maybe if you’re Gigi or Bella. Forecasters say there is no end in sight for this fashion moment, so consider tasteful and comfortable ways you can incorporate it in your wardrobe if you haven’t already. My guess is you have and you’re loving every cozy minute of it. Namaste!